If you own a Apple device like iPhone or iPad and have upgraded to its latest iOS 6, you may have been facing a weird issue with Wi-Fi. Even when every other device is able to connect to your WiFi router without any issue, your iOS 6 device iPad or iPhone is unable to connect to your WiFi and often gives you error that it cannot connect to WiFi. Even though, Apple says that it has released updates/ patches to fix WiFi issues, I faced it even on the latest iOS 6.1.3 on my iPad 2. In this post, we will talk about how to fix this WiFi issue. This fix hopefully will work for almost everyone who is facing this issue. I had tried all other fixes before trying this one and none of the fixes worked for me (listed below). Check the type of connection of WiFi you are using. If you find that You are using a WPA or WPA2 WiFi encryption, then most probably this is the root of the problem. You should change your router settings for the WiFI to WEP (64 bit or 128 bit) Encryption instead of old WPA encryption. That’s it. Now you wont face any weird WiFi Issues ever with your iOS 6 iPad or iPhone. If Fix 1 stated above didnt worked for you, Just try resetting your Apple device Network settings. To reset the network settings, Navigate to Settings >> choose “General” >> choose “Reset Network Settings”. 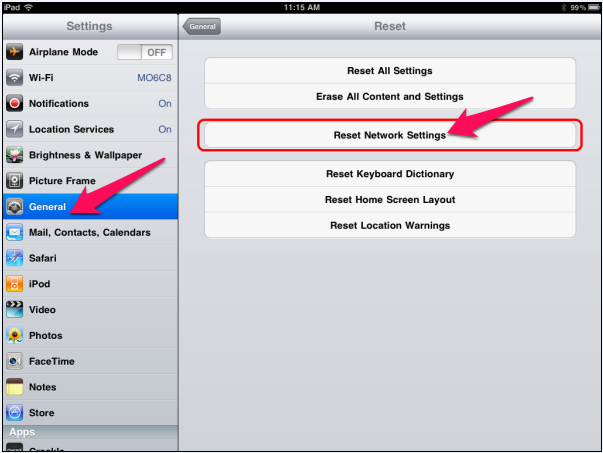 This will reset iPad, iPhone network settings and revert to the default factory settings. This will reboot your device and you will need to enter your WiFI password again to connect to WiFi. Navigate to Settings>Wi-Fi>(“Your Network”)> [the blue circle arrow icon]. Scroll to bottom of screen and set HTTP Proxy to Auto. You’ve made a serious error. WEP is the old (very un-secure) wifi encryption protocol. WPA is the new protocol and is much more secure. Switching to WEP is leaving you open to security risks.